The first issue 9″ x12″ 168 pages, pink cover with BLAST written diagonally in large black letters. It featured a Vorticist Manifesto, along with lists of BLASTS and BLESSINGS. The second issue was 112 pages and its cover featured a Vorticist sketch. Searchable PDFs of full run available online at Brown University’s Modernist Journals Project. 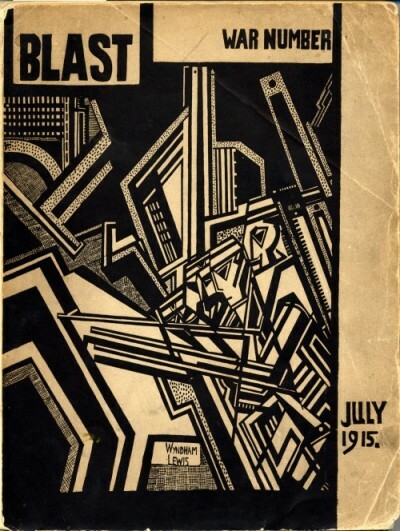 BLAST, the brainchild of Ezra Pound and Wyndham Lewis, was a highly experimental little magazine created to showcase the burgeoning Vorticist movement. Vorticists aimed to discredit both the “hullo-bulloo” of Futurist “Marinetteism” as well as Imagism’s adherence to “beauty…in the object or content,” and its bold images demonstrated a brash disregard for both the “snobbery” of the elitist avant-garde and the “AUTOMOBILISM” of popular art (Lewis 10). According to Lewis, BLAST was a “battering ram” for the Vorticist movement, a bold attempt to deconstruct the divisions in English society between the poor who “are detestable animals,” and the rich who “are bores without a single exception” (10). BLAST published only two issues, the June 1914 issue and the July 1915 “War Issue.” The first issue opens with the Vorticist Manifesto and moves to extensive lists of BLASTS and BLESSINGS. These chaotic catalogues address the aesthetics, politics, and popular consciousness of the “great art vortex sprung up in the centre” of England in the early twentieth century (Lewis 9). The second issue contains artwork and contributions from T. S. Eliot and Ezra Pound, among others. The magazine features bold experiments in typography and graphic art, and brazenly declares the goals and beliefs of the short-lived Vorticists. DISMAL SYMBOL, set round our bodies, of effeminate lout within. the flabby sky that can manufacture no snow, but can only drop the sea on us in a drizzle like a poem by Mr. Robert Bridges. BLESS cold magnanimous delicate gauche fanciful stupid ENGLISHMEN. Blast. 1:1 (June 1914) 11 – 26. The editors followed their BLASTS and BLESSINGS with another Manifesto, which consisted of a list of 63 objectives. Percy Wyndham Lewis, editor for BLAST‘s two-issue run and sole editor of The Enemy, was born in Amherst, Nova Scotia, Canada. Described as an “English Cubist” painter and writer, Lewis enjoyed a respected reputation among London’s young avant-garde and teamed with Ezra Pound in 1912 to form the Vorticist movement. Lewis published BLAST to explain the aesthetic theory and showcase the achievements of the “Anglo-Saxon Genius” of the Vorticists (Lewis, qtd. in Seshagiri 582). The short-lived movement died out after World War I and demand for Lewis’ art floundered as he shifted to studying political theory, philosophy, sociology, and anthropology (Cassidy 5). By the mid-1920s Lewis contributed frequently to a variety of modernist Littles and furiously published dozens of books and manifestos. In a 1922 issue of CriterionLewis proclaimed his role as an adversary to those he labeled “amateurs”, “apes”, and “mock artists” who stole valuable studio space and column inches from “professionals” like him; a few weeks later, Lewis published again in Criterion to announce his new “Enemy” persona against such artistic imposters (Hannah 4). Five years later, Wyndham Lewis created The Enemy as a space for him to distance himself from the disdained avant-garde scene. Despite the scathing reviews he published in his magazine of such widely-acclaimed authors as James Joyce, Sherwood Anderson, and even Sigmund Freud, T. S. Eliot described Lewis as ”the most fascinating personality of our time…the most distinguished living novelist” (von der Ropp). Hoffman, Frederick J., Charles Allen, and Carolyn F. Ulrich. The Little Magazine: A History and a Bibliography. Princeton, NJ: Princeton UP, 1947. Images. “Blast: Review of the Great English Vortex.” The Modernist Journals Project. Brown University. 14 July 2009. Kadlec, David. “Pound, Blast, and Syndicalism”. ELH, 60.4 (Winter 1993): 1015-1031. The Modernist Journals Project. 2007. Brown University. 14 July 2009. Reynolds, Paige. “‘Chaos Invading Concept’: Blast as a Native Theory of Promotional Culture”. Twentieth Century Literature, 46.2 (Summer 2000): 1015-1031. Seshagiri, Urmila. “Racial Politics, Modernist Poetics.” Modernism: A Comparative History of Literature in European Languages. Eds. Astradur Eysteinsson and Vivian Liska. Philadelphia: John Benjamins Publishing Co., 2007. 582. Tuma, Keith. “Wyndham Lewis, Blast, and Popular Culture.” ELH, 54.2 (Summer 1987): 403-419.